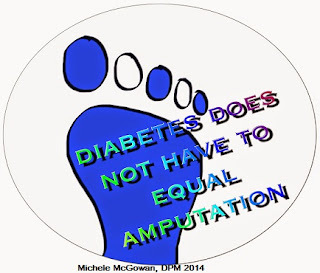 Center for Ankle and Foot Care Blogspot: Diabetic and don't have a foot doctor? 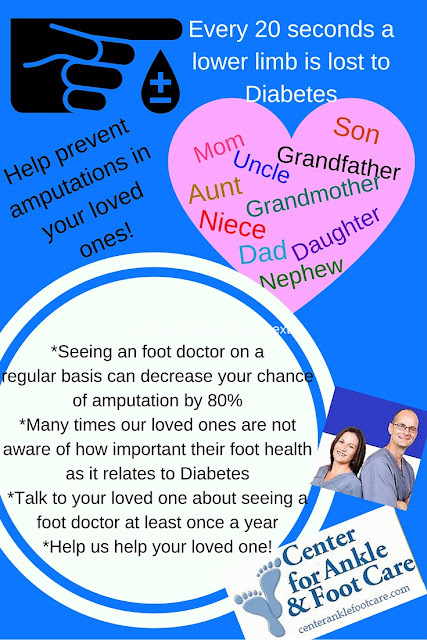 Quickly three reasons why you need a foot doctor!! If you are diabetic, you can not avoid the thought in the back of your brain of someone who had a limb amputated due to diabetes. Everyone has a story of an uncle, aunt or grandparent who suffered with an amputation due to complication of diabetes. Every 20 seconds someone loses a limb due to diabetes according to Armstrong, et al, Diabetes Care 2013. According to a study in the Journal of American Medicine in 2005: up to 25% of those people with diagnosed with diabetes will develop a foot ulcer. More than half of those have the risk of becoming infected and 20% of the infections will go on to amputations according to Lavery et al Diabetes Care 2006. Seeing your podiatrist quarterly, they will inspect your feet, identify any pressure spots that could predispose you to an ulceration and offload these spots to prevent the calluses from forming that often develop wounds if not routinely debrided in the diabetic patient. Wow! thanks for sharing this precise but informative article. Best Podiatrists in New York City for Foot and Ankle are also working hard to get people back on their feet!